Dakota Access pipeline will start operating without a proper response plan. The pipeline is allowed to start pumping oil Thursday. 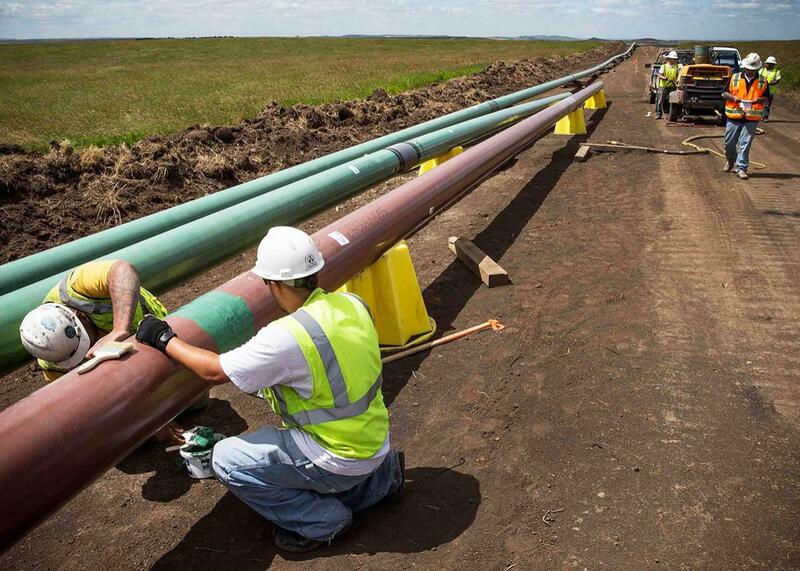 Construction workers work on a section of pipeline on July 25, 2013, outside Watford City, North Dakota. This piece is republished with permission from InsideClimate News, a nonprofit, nonpartisan national news outlet. Oil began flowing through the controversial Dakota Access pipeline starting Thursday, but there is still no oil spill response plan in place for the section of pipe that crosses the Missouri River just upstream from the Standing Rock reservation. The company won’t be required to have emergency response cleanup equipment stored near the river crossing for another year, either. The lack of rigorous safety measures for the crude oil pipeline is raising concerns from lawyers and pipeline consultants for the Standing Rock Sioux tribe, whose protests and legal fight against the Dakota Access pipeline became a flashpoint for environmental justice and indigenous rights last year. Despite the prolonged resistance, the pipeline began operating Thursday, after President Donald Trump issued an order expediting its approval. Dakota Access LLC, the company building the pipeline, is required by the Pipeline and Hazardous Materials Safety Administration to submit a general emergency plan for the entire half-million-barrel-a-day project before oil shipments begin. But no deadline has been set for it to submit a more detailed plan for the controversial Missouri River crossing as required by the Army Corps of Engineers. Without a complete emergency response plan and no requirement to have response equipment in place for another year, a spill in the months ahead could cause tremendous environmental damage, pipeline safety experts say. “If you have a catastrophic rupture, will you be able to handle it?” asked Richard Kuprewicz, president of Accufacts Inc., a consulting firm that provides pipeline expertise for industry and other parties. Kuprewicz works with the tribe’s lawyers reviewing documents. “It’s hard enough when you have the detailed plan. If you don’t have one, it’s probably not going to work,” he said. The information about Dakota Access’ emergency plans came to light in April after a legal battle over their release. The pipeline company filed a motion in federal court to keep the documents sealed, claiming they contained security-sensitive information. The tribe contested the motion, and a federal judge subsequently agreed to release most of the information—but with large sections redacted. The documents offer the first public details of how Dakota Access would respond to a spill into Lake Oahe, a reservoir on the Missouri River and the tribe’s primary source of drinking water. The pipeline crosses Lake Oahe half a mile upstream of the reservation. The plans were released as part of an ongoing lawsuit by the tribe against the company and the Army Corps seeking a more thorough environmental analysis of the pipeline. “Seriously incomplete, even deficient” is how Kuprewicz described the response for Lake Oahe. In addition to the lack of plans and equipment, Kuprewicz and other pipeline safety specialists said they are concerned that the company has underestimated the time it would take to respond to a spill and that it therefore has underestimated the volume of a worst-case scenario. Dakota Access has said its pipeline will be equipped with state-of-the-art leak detection sensors that would easily identify spills. It claims it could spot a leak within nine minutes and could shut down the leaking section of pipe within 12.9 minutes. Federal data has shown that leak detection systems do not provide as much protection as the public is led to believe. As the company begins shipping oil, other parts of the pipeline have already leaked. An above-ground station and a feeder line leaked more than 100 gallons of oil in North Dakota in March. The pipeline also leaked 84 gallons of oil at a pump station in South Dakota on April 4. “As with all of our pipeline projects, safety is the company’s top priority—the safety of our employees who build and operate them, the safety of those who live in the communities through which our pipelines pass, and the safety of the environment which surrounds them,” Dillinger said. While Dakota Access is not required to have its own emergency response equipment in place near the Missouri River until one year after operations begin, the company has listed contractors that it would work with to provide emergency response equipment and personnel in the event of a spill. Such equipment would be farther away—in some instances more than 400 miles away in Wisconsin and Minnesota—and would take more time to mobilize than an equipment storage facility built by the company near the river crossing. Earthjustice’s Jan Hasselman, an attorney representing the Standing Rock tribe, said the tribe was not consulted on the emergency plans and only saw the documents after the judge unsealed them on April 7. So far, Dakota Access has produced two drafts of a detailed emergency response plan for the Lake Oahe crossing. An August 2015 draft, unsealed by the judge in April, said any oil spilled into the river would be diverted to the reservation’s shoreline. A revised draft from March 2016 said the oil would be diverted to the opposite shore. Dakota Access would not say if it intends to produce a final plan. In response to the pipeline company’s claims, the U.S. Department of Homeland Security’s Sensitive Security Information program reviewed the documents and wrote that none of the records that Dakota Access sought to keep sealed contain any “sensitive security information.” PHMSA, however, concluded that some of the information “could reasonably be expected to endanger the life or physical safety of [individuals],” and the court agreed to redact such information. The documents that have been unsealed include the 2015 and 2016 draft emergency response plans for the Lake Oahe crossing, including location details for the emergency response equipment; a redacted copy of the company’s more general draft emergency response plan for much of the 1,200-mile North Dakota–to-Illinois pipeline; and a redacted worst-case spill size estimate for Lake Oahe and other river crossings. That document is so heavily redacted that it offers the public little information about Dakota Access’ preparations for a spill. “The thing that is frustrating to me is the redactions are the things that make you able to figure out whether the plan is adequate or not,” said Rebecca Craven, program director for the nonprofit Pipeline Safety Trust. The U.S. Coast Guard, which regulates oil tankers and oil tanker loading facilities, and the U.S. Environmental Protection Agency, which regulates oil refineries, require more detailed, site-specific emergency response plans than those required by PHMSA, said Paul Blackburn, a pipeline safety expert and attorney with Honor the Earth, a Native American environmental advocacy group. The sharpest contrast to the lax emergency response requirements for the oil pipeline perhaps are the oil spill response measures required for a small wind farm off Rhode Island that came online in December. The Block Island Wind Farm, the nation’s first offshore wind farm, had to have a detailed, final oil spill response plan for the small amount of oil contained in each of the wind farm’s five turbines. The turbines require small amounts of lubrication grease and oil to keep the turbine blades spinning and generators producing electricity. Mineral oil is also used to insulate an electrical transformer within each turbine. The plan had to be approved before construction began by the U.S. Army Corps of Engineers, the same agency overseeing the Dakota Access pipeline. The company also had to demonstrate that it had spill response equipment in place before the project began sending electricity to the mainland via a subsea cable. Kuprewicz’s main concern is the company’s claim that it can identify a leak in nine minutes and shut down the leaking section of pipe within 12.9 minutes. Ten days later, it took Enbridge 17.5 hours to confirm a leak and shut down its 6B pipeline after oil began gushing from the pipeline into Michigan’s Kalamazoo River. Approximately 1 million gallons of tar sands crude oil spilled during the leak, making it one of the worst inland spills in U.S. history. Prior to the spill, Enbridge’s emergency response plan claimed it could detect a leak and shut down 6B in eight minutes. “You may have a plan because you are required to have a plan, but you can’t guarantee that it will work,” Kuprewicz said. But what if Dakota Access’ assumptions are correct—that it could identify a major leak and shut down the pipeline within minutes? How much oil would spill if the line ruptured under the Missouri River near the Standing Rock reservation? That worst-case figure was redacted in the spill model for Lake Oahe that was released by the court. But Blackburn estimated that a spill that took just 13 minutes to detect and shut off would leak approximately 630,000 to 903,000 gallons of oil. His calculation was based on the pipeline’s diameter, flow rate, and distance between shut-off valves, data that is available in public documents, as well as similar calculations from pipeline companies Enbridge and TransCanada. The 1-million-gallon Kalamazoo spill required 157,000 feet of boom, 43 boats and 79 vacuum trucks to divert and clean up the oil during the peak of cleanup operations. Dakota Access LLC is planning for just 6,600 feet of boom, six boats and nine vacuum trucks for a worst-case spill in the Missouri River’s Lake Oahe reservoir, according to the company’s draft Lake Oahe spill response plan. PHMSA has said it reviews and approves oil spill response plans in accordance with federal laws, and the agency is not involved in reviewing or approving the detailed response plan for the Lake Oahe crossing. As Dakota Access readies to ship oil, the agency’s assurances offer little comfort to the attorney representing the tribe.